Assured Access Insurance – An insurance plan to protect you for LIFE! Why should I be concerned about this now? If you’re covered by an employer sponsored plan now, you may not be covered forever. Circumstances change: maybe you’ll start working for yourself, decide to stay home with the kids, experience job loss or career change or you may reach retirement. If you wait until then to apply for a personal health plan, you will have to answer medical questions based on your health at that time – any existing health conditions will not be covered. Qualify now, and you are guaranteed access to a health plan in the future regardless of changes to your health! Think of it like us saving you a seat – it’s guaranteed! As we age our health often deteriorates, making it difficult to be approved for health insurance later in life. After qualifying for Assured Access, you and your family can enrol in a Medavie Blue Cross personal health plan without answering medical questions. That means if you ever lose your employer sponsored benefits, for any reason, you and your family are automatically approved for a personal *Elements plan – regardless of any health conditions you may have developed since purchasing the Assured Access. *Elements provides comprehensive coverage that includes extensive drug, dental, hospital, travel, and health benefits. Why should I get Assured Access? When Jennifer was laid off from her current job, it was not the mortgage or other bills she was worried about – it was paying her drug costs. The $24,000 a year cost of Enbrel, which is used to treat her rheumatoid arthritis had been covered by her employer group plan. She is among the 10% of Canadians (3.6 million) who have difficulty affording prescription medications. This story is a great example to show how important it is to secure your access to a health insurance plan. 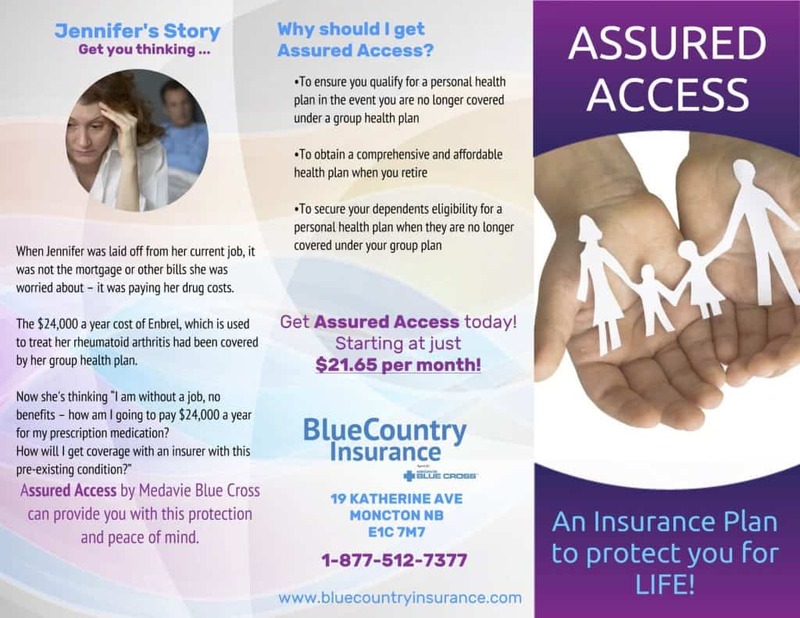 Assured Access by Medavie Blue Cross can provide you with this protection and peace of mind. Why should I buy additional health insurance on top of my current group plan from work? Think of Assured Access as an essential part of your financial planning process – Could you afford to pay for prescription drugs out of your own pocket? What about visits to the dentist or optometrist? These expenses can quickly empty your savings. 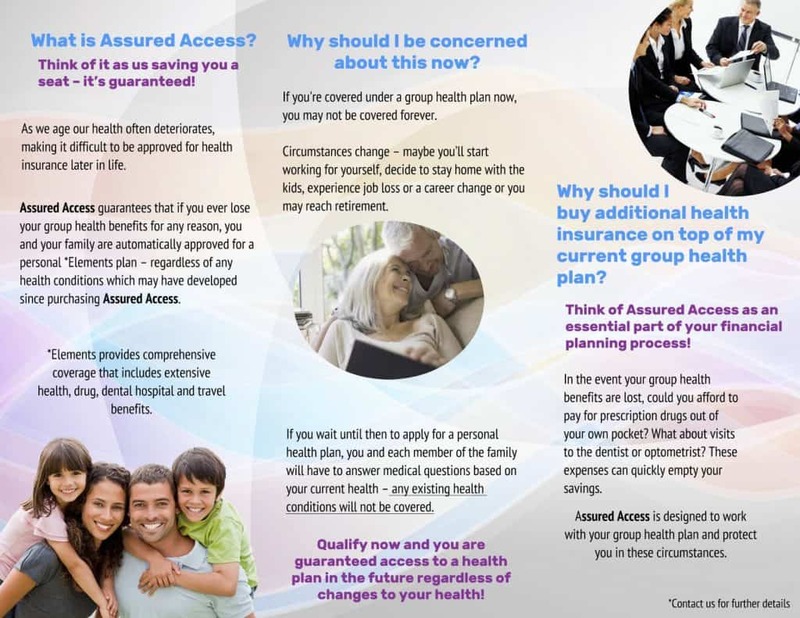 Assured Access is designed to work with your group health plan and protect you in these circumstances. Get Assured Access today, starting at just $21.65 per month! *Assured Access also includes up to $10,000 of Accidental Death and Dismemberment! *Assured Access coverage can continue beyond the age of 65!